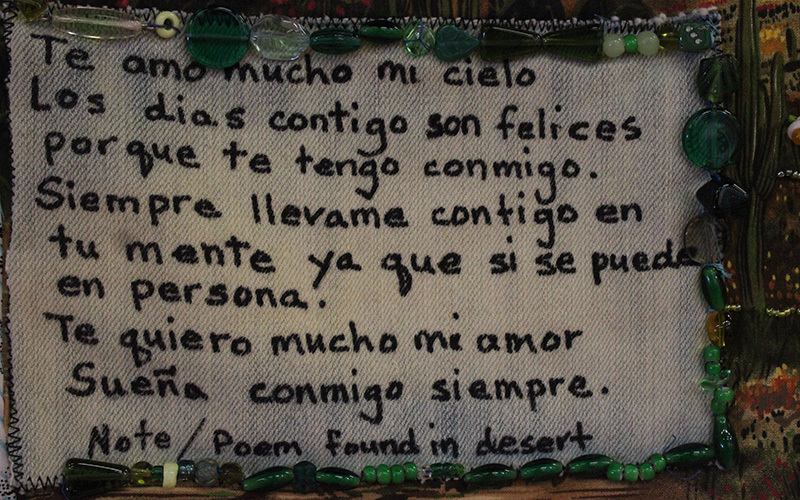 AMADO — Tattered jeans, backpacks, and love letters are stitched together and tell the story of migrants who made their way into the U.S. through the Arizona desert but perished before reaching their destination. A previous version of this story gave the incorrect name of the Tucson Sector and U.S. Customs and Border Protection. The story here has been corrected, but clients who used an earlier version of this story are asked to run the correction that can be found here. One resident of this southern Arizona town recounted meeting a migrant who crossed through her backyard on his way to a chicken processing factory in North Carolina. He was one of the lucky ones. Not all border crossers complete their journey to prosperity. To those who are left behind and have died in the Tucson Sector, there is a group that makes sure their deaths are not forgotten. “The goal is to humanize these people,” said Jody Ipsen, founder of the Migrant Quilt Project. She started the project after coming across a migrant lay-up site in the Huachuca Mountains in Arizona. Migrants stop in designated areas to change clothes, rest, and drink water before continuing their travels. Describing herself as a naturally curious person, Ipsen said the encounter piqued her interest in the migration crisis at the time and the reasons that motivate border crossers to take on the life-threatening route. 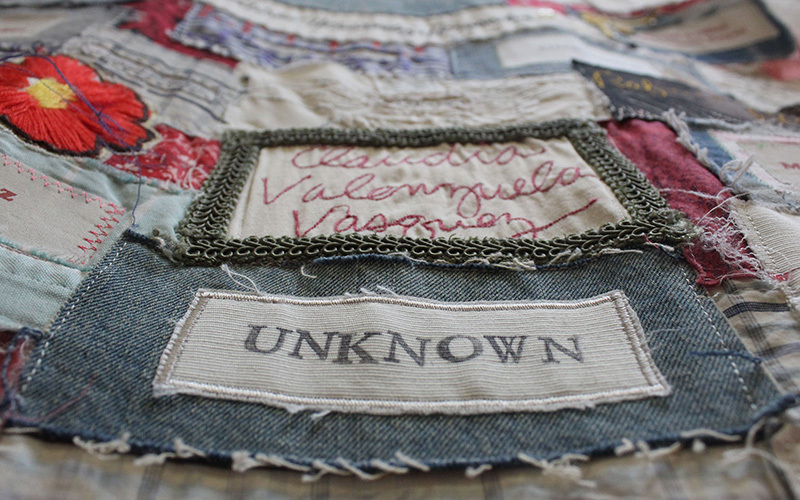 Since its start in 2007, the Migrant Quilt Project has compiled the names of the bodies found in the Tucson Border Sector and examined by the Pima County Office of Medical Examiner (PCOME). In addition to the report, quilters request a list with the names of the deceased men and women. According to the medical examiner’s office, most migrants are Mexican-foreign born males. 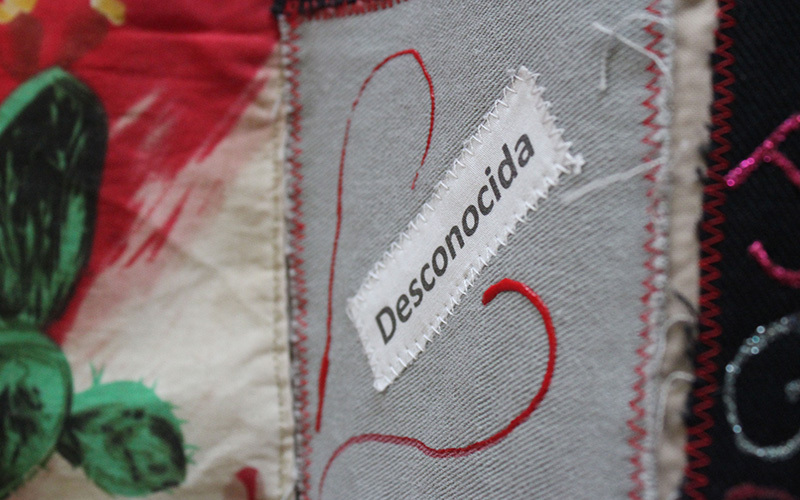 If a person can’t be identified, they’re represented in the quilts as unknown or “desconocido/a” in Spanish. 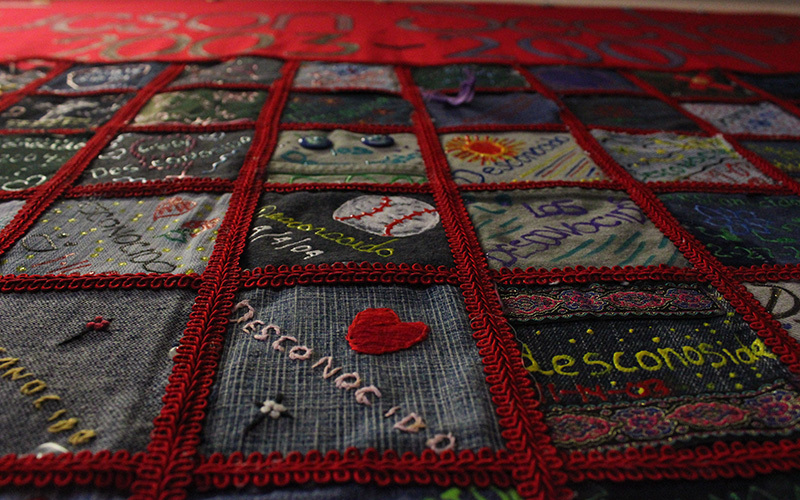 A quilt dedicated to reported undocumented immigrants who passed away in the Tucson Sector in 2012 includes names, the cause of death, and the conditions in which the 157 bodies were found that year. In 2012, according to medical examiner’s office, 107 bodies were reported with undetermined cause deaths, mostly due to decomposition. They accounted for 68 percent of the bodies examined that year. Since 2001, the medical examiner’s office has examined 2,465 bodies of suspected undocumented border crossers. 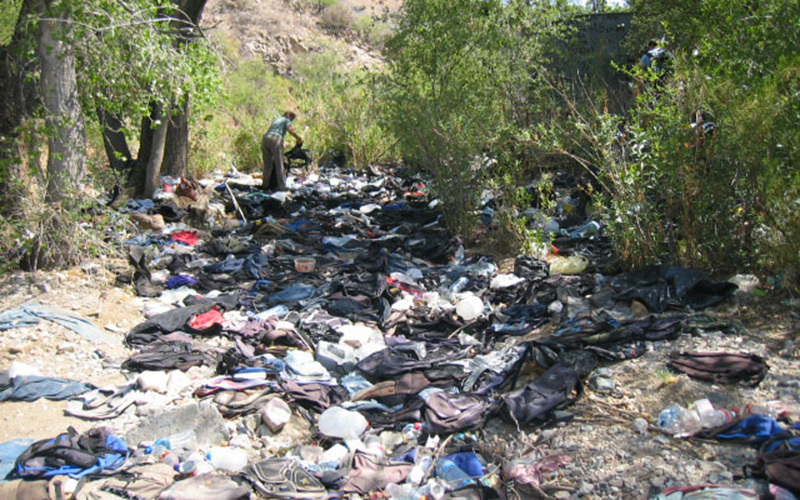 The reported average since 2001 is 171 bodies per year in the Tucson Sector. “I read the names and they are so beautiful. 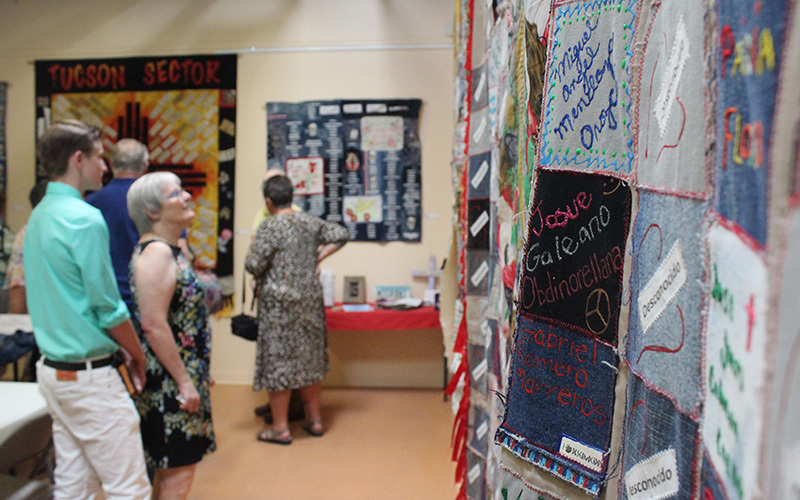 I was very moved by the history of these people,” said Cornelia Bayley, an activist and quilter who joined the project when she moved to Tucson from northern California. “Every hour I spent making the quilts, I felt like I was honoring them,” Bayley said. Arriving with little knowledge of the desert, she decided to help Ipsen make quilts. “I really related to the terror of those people, especially the first quilt I made,” Bayley said. Bayley has found money sewn into the migrants’ clothes. She said she believes the border crossers would do so in order to assure the money wasn’t taken away from them. “As I made that quilt, I kept thinking about that person and how that was their special money,” she said. The Migrant Quilt Project does not use clothing of the deceased. Most of the material comes from lay-up sites, but Bayley said some of her personal items are embedded in her quilts in order to better tell the story of the migrant’s journey. “I want to show what a migrant goes through on a daily basis,” she said. “It’s really important to show the humanity of these people, especially with the political spectrum right now and calling them illegal,” Bayley said as she introduced her quilt to the Unitarian Universalist Congregation in Amado. “They’re coming up here because they are desperate, they are afraid, nobody would cross the desert if you really had no other option,” she said. In Arizona, apprehensions in the Tucson and Yuma sectors have decreased, according to U.S. Customs and Border Protection. In the past 10 years, apprehensions have decreased by 86 percent. According to reports, the cost of migrating has gone up, leading to a decrease in migration to the U.S. Still, Ipsen said, migrant deaths continue to be the central subject of the project. “I wish we would all do research and put everything into context ourselves and not let things coming from the White House to influence our opinion,” Ipsen said. According to Ipsen, the project creates awareness through exposition. The Migrant Quilt Project has been featured in different art expositions in festivals and religious congregations. Twelve quilts are on display through the end of April at the Unitarian Universalist Congregation, 15 County Line Rd., in Amado.